We don’t have severe winters here in N.C. but we do get to freezing temps, not so good for garden vegetables. So before the first threat of frost last fall, we gathered the remaining tomatoes from our garden. 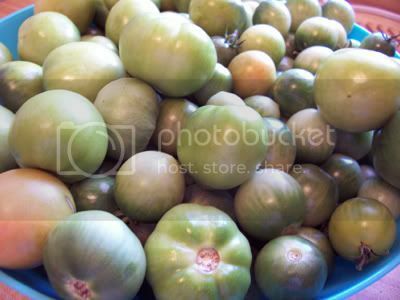 There were still lots of green tomatoes left. You can ripen green tomatoes by wrapping them in newspaper and storing them in a a cool dark area in your pantry. We were still eating tomatoes from our garden well into December from the tomatoes we had ripening in the pantry. We also made this chutney that we gave out for Christmas and still have some jars in our pantry. This is a great way to preserve tomatoes and keep enjoying them for the rest of the year. I borrowed several recipes online and from recipe books and this is what I came up with. In a heavy bottomed pan, heat the oil and fry the spices for a minute. Pour in the blended garlic, ginger and chilis and fry for another couple of minutes until it is fragrant and bubbly. Simmer the mixture for 2-3 hours until it has thickened. When your chutney has thickened, cool for an hour and then store in sterilized jars. 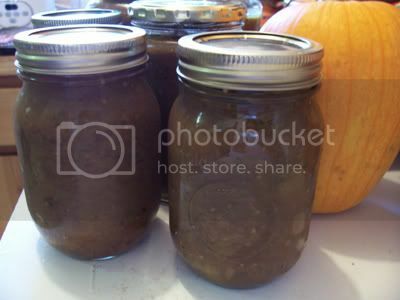 You can get tips on sterilizing your jars and processing your canned products from this site. 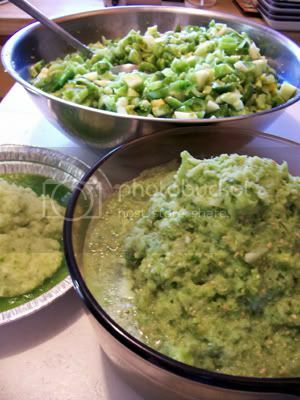 Process your canned chutney for about 40 minutes. Follow these directions on how to process your chutney. hi julie, yes, I was so glad to find a way to use up all the green tomatoes at the end of the summer. Plus, it made for a great relish the rest of the time! We just had hot dogs over the weekend, and these were a perfect condiment. That’s a good idea for all my tomatoes at the end of the season that fail to turn red.